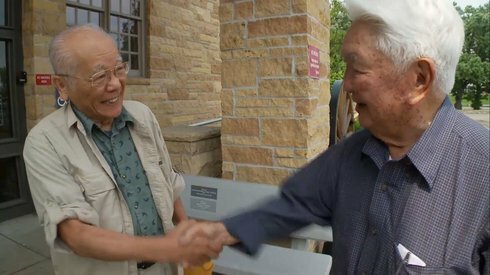 A scene from The Registry in which Seiki Oshiro meets Grant Ichikawa in person for the first time after years of collaborating via the Internet on compiling a registry of all those who went through MIS training at either Camp Savage or Fort Snelling in Minnesota. If you remember PBS’ 2007 Most Honorable Son—a documentary about Nebraska Nisei farmboy turned B-24 and B-29 turret gunner Ben Kuroki—then you’re familiar with the work of Bill Kubota. The Detroit-based documentarian, a partner at KDN Films, is now working on finishing The Registry, a new feature more than seven years in the making on another aspect of the experience of Japanese Americans who served in the United States military during World War II. In this case, the focus is on the Military Intelligence Service. There were more than 7,000 Nisei and Kibei Nisei Japanese Americans who studied Nihongo and Japanese military terminology as part of the U.S.’ war effort in the northern cold of Minnesota’s Camp Savage and Fort Snelling following the United States’ 1941 entry into the war against Japan in Asia—and Germany and Italy in Europe and North Africa. The MIS’ combined efforts as translators, interpreters, and interrogators are said to have shortened the war in the Pacific by two years. Earlier this month, the Center for Asian American Media announced that The Registry was among several film projects that received Winter 2017 CAAM Documentary Fund Awards to help finish the project, with Kubota looking at having it completed early next year. According to Kubota, The Registry is not meant to be “another history lesson show about the MIS.” After all, there have been a few documentaries now, including director Junichi Suzuki’s MIS: Human Secret Weapon, which do that (www.rafu.com/2012/03/itns-29/). Rather, Kubota and his cousin and partner on the movie, Steve Ozone, wanted to tell the stories of at least some of the men who served in the MIS during WWII—a task with several built-in obstacles. Then, among those MIS men who survived not having been killed in combat during WWII (and that did happen, with Oregon’s Frank Hachiya a case in point, one of the stories related in The Registry), many have since died, taking their stories to their graves. For others, Kubota believes, there were experiences some didn’t want to discuss—oftentimes revealing little even to their own offspring. “Some of these guys really didn’t want to talk about it because they were in the midst of a war,” he said. “Things happened that they probably didn’t want to remember too deeply.” Fortunately, there were some MIS vets who were willing to discuss their experiences. Kubota also noted that the MIS men were originally told not to discuss their WWII experiences, because some of what they did was considered classified. Add to that the general taciturn tendencies of American men of that generation overall, then combine that with a Nisei mentality of not drawing attention to oneself, and it’s almost a wonder anyone knows anything about the exploits of the MIS, much less what they accomplished! But, in the preliminary long version of The Registry Kubota was considerate enough to let me view, some of those stories are, thankfully, saved for future generations. The tough part will be what to keep, because in order to air on PBS, it has to clock in at what he called “the PBS standard of 56:46” (less than 60 minutes). For Kubota, the project began when he and Ozone began video recording oral histories for the National Park Service in the Twin Cities region in Minnesota, the same state where Camp Savage and Fort Snelling are located. It was this coincidence that proved to be an entry point for Kubota to tell a larger tale. Steve Ozone, Cedrick Shimo, and Bill Kubota, from August 2011, in the early days of shooting footage for The Registry. Shimo appears in the upcoming documentary. 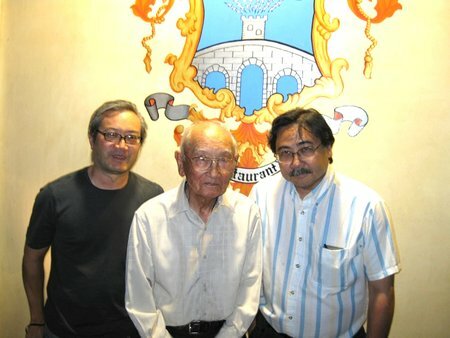 The bulk of the footage was shot between 2011 and 2013, Kubota said, and it included the Congressional Gold Medal ceremony that recognized the MIS and 100th Battalion/442nd Regimental Combat Team in Washington, D.C.; a 2013 Merrill’s Marauders reunion in Minnesota; and visits to Arizona, Maryland, Oregon, and Los Angeles, among places Kubota and Ozone went to shoot on location. In addition to the vets already noted previously, also featured or mentioned are MIS vets Terry “Guts” Doi, Mas Inoshita, John Okada (author of No-No Boy), and Roy Matsumoto, who was also the subject of his own 2014 stand-alone documentary titled Honor & Sacrifice: The Roy Matsumoto Story. Matsumoto famously—or infamously, depending on one’s viewpoint—was attached to Merrill’s Marauders and using his Japanese language skills, ordered Japanese soldiers to charge, which they did, right into an ambush that killed them by the dozens. His daughter, Karen Matsumoto, who co-produced Honor & Sacrifice, also appears in The Registry. Since Matsumoto lived to be 100 (he died in 2014), she was as an adult able to ask her father about what he did—but appears to be resigned to a personally unsatisfying conclusion that as far as he was concerned, it was war and that he did what he did and that’s that. Kubota says that while the recent grant will help him and Ozone finish The Registry, there will likely be two versions—one that is edited to run on PBS with a duration of just under an hour and one that runs at least 90 minutes. I’m looking forward to both versions; it will be interesting to see how Kubota ultimately weaves all the different threads and stories into a final version that will give future Americans insight into a unique group of people who came together to serve their country under trying conditions. *This artice was originally publised in The Rafu Shimpo on March 26, 2017. George Toshio Johnston is the former director of business development at The Rafu Shimpo, where he also has written a column on media, “Into the Next Stage,” since 1992. He began his print journalism career at Pacific Citizen the newspaper published by the JACL. His résumé also includes working for the Wave Newspapers, Daily Journal Corp, the Pasadena Star-News, San Gabriel Valley Tribune, Orange County Register, Hollywood Reporter, and Investor’s Business Daily. He also served a stint as editor of Yolk Magazine. In years past Johnston has been active in JACL, AAJA, and MANAA, which he conceived of and co-founded. He is a founding member of the Writers Guild of America’s Asian American Writers Committee, is a graduate of the UCLA School of Theater, Film and Television’s Professional Program in Screenwriting and he also produced, wrote, directed and edited “Going for Honor, Going for Broke: The 442 Story,” an award-winning short-form documentary on the 100th Battalion/442 Regimental Combat Team. Johnston is married to Sachi Johnston and is the father of two children, Akari and Jameson. He resides in Culver City.